This is not your Grandpa's Polka Band ... this is THE ROCKIN' POLKA BAND! The Bavarian Beer Garden Band (BBGB) is a uniquely Northwest festival band with an attitude and a twist. They wear traditional Bavarian folk costumes and play music ranging from traditional European Alpine Folk and German Pop (Schlager) to lively Polkas and well known PARTY ROCK songs! Just when the audience thinks they have it figured out, they are blown away as the band transforms into a high energy R&B show they call the BAVARIAN BLUES BROTHERS! The BBGB show is infectious, compelling. You cannot help tapping your feet, singing along, clapping your hands or dancing to the music, .....and it's not unusual to see HUNDREDS of people pack the dance floor when they entertain. BBGB is DIFFERENT! BBGB is ENERGY! BBGB is ENTERTAINMENT! 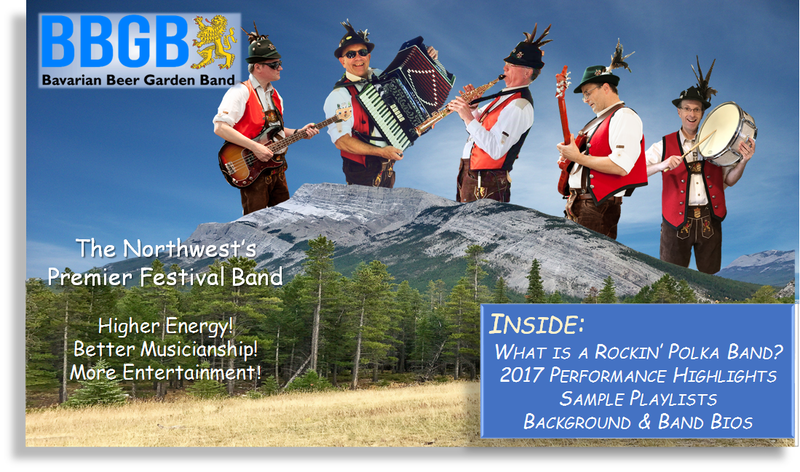 The Bavarian Beer Garden Band is a uniquely entertaining band that specializes in Beer Festivals, City Festivals, Oktoberfest, Corporate Parties, Private Parties, Beer Halls, Taphouses and Beer Gardens, Wine Events, Senior Homes and MORE! BBGB features top shelf musicians who represent some of the best in their field. Click here to meet the Band! Octoberfests: Kirkland Oktoberfest (3 days); Puyallup Oktoberfest NW (2 days); Spokane Oktoberfest (3 days); Fish Brewing Taphouse, Woodinville; Queen Anne Beerhall (multiple shows); Crossroads Farmer's Market; Crossroads Market Stage Bellevue; Ounces Taproom West Seattle. Corporate parties: Microsoft Corporation (1200+ employees); Windermere Real Estate (400+ guests); Eastside Catholic School. Weddings: large wedding event at the Polish House, Seattle. Senior Entertaining: Madison House, Kirkland; Merrill Gardens, Kirkland; The Gardens at Juanita Bay (Formerly German Retirement Home), Kirkland; Chateau Bothell Landing, Bothell; Woodland Terrace, Bothell; Brittany Park, Woodinville; Fairwinds Redmond, Redmond; Queen Anne Manor, Seattle. Click Here to see BBGB Testimonials! In Heaven There Is No Beer, Beer Song Medley, Beer Barrel Polka, Trink, trink, Brüderlein Trink! Beer Barrel Polka, Hoop De Doo, Pennsylvania Polka, Just Because, Ay Jalisco, Clarinet Polka, Hasselbysteppen-Under the Double Eagle, The Village Tavern, The Blue Skirt Waltz, Happy Wanderer, Chicken Dance, and many more! Brown Eyed Girl, OblaDi-OblaDa, Sweet Caroline, Ventures Medley (fan favorite! ), 500 Miles, Lambada, Jambalaya, Play That Funky Music, Sleep Walk, I Saw Her Standing There, Do You Love Me?, Margaritaville, and many more! Wedding Standards: Come Fly With Me, It Had to be You, My Romance, The More I See You, Til There Was You, Unforgettable, When I Fall in Love, You Are So Beautiful, and many more! Can't Turn You Loose, Everybody Needs Somebody To Love, Soul Man, Gimme Some Lovin, New Orleans, She Caught The Katy, Flip Flop & Fly, Mustang Sally, Sweet Home Chicago, and many more! The Bavarian Beer Garden Band is versatile and comfortable playing on a large sound stage or setting up their own deluxe sound system with engineer to bring a high quality sound to your venue. One of the things their clients especially appreciate is BBGB knows how to "roll with the flow". Working with the Bavarian Beer Garden Band is stress free and easy. 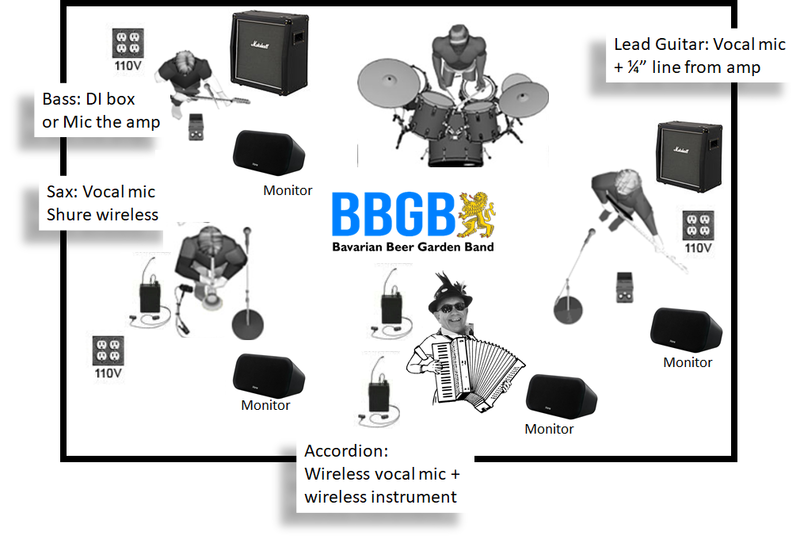 The BBGB sound system includes up to four (4) 1100 watt powered mains, bass amplifier, 16-channel analog mixer, stage monitors, wired and wireless microphones, mic & speaker stands, and cabling. A convenient 110v power source is required. BBGB performs year 'round, but does require cover in case of inclement weather. 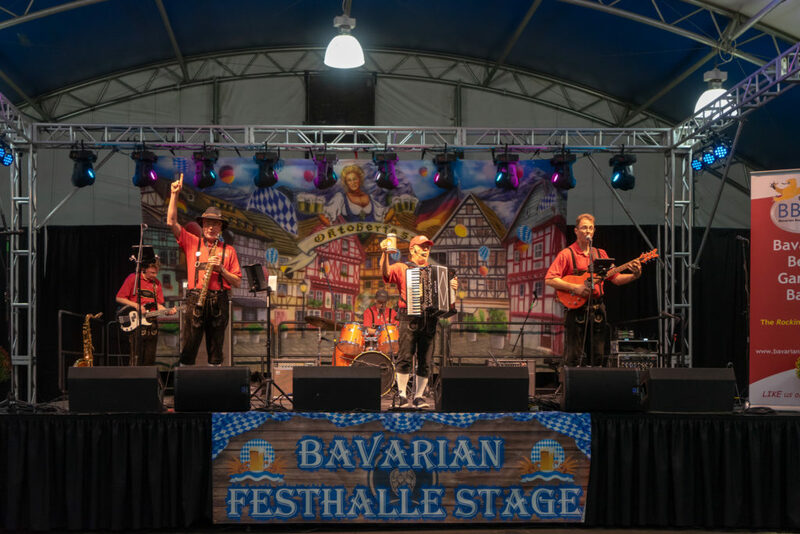 If you are looking for a dynamic band to captivate your audience and keep them dancing and drinking beer for hours, look no further than the Bavarian Beer Garden Band! People in all age groups stop, listen and stay when BBGB starts to play. Why? BBGB is different, BBGB always brings a lot of energy and BBGB is always entertaining! And, you will appreciate the Bavarian Beer Garden Band professionalism and flexiblity when working with you and your venue!. To inquire about booking the BBGB, give us a call or an email today! The Northwest's Premier Festival and Oktoberfest Band!